The concerts at CIMF are varied, often with mixes of performers. This was called Classic Souvenir: obviously classical but again well varied. First up was Schubert on fortepiano, then Beethoven on fortepiano and violin, then a string sextet from Tchaikovsky. Perhaps he's romantic, but it's related. Keiko Shichijo performed Schubert Impromptu op.90 no.3 in the damnable key of Gbmajor. But then it's different on piano. It was likely developed from improvisation but the effect is an attractive melody with a busy left hand. Then Cecilia Bernardini joined for Beethoven Sonata for violin and piano in G major. Now here's a gentle key! It was written for the Archduke and a specific violinist as a "musical dialogue with refined classic gestures" (Roland Peelman from the notes). There was a lovely and generous musical playfulness and awareness between these two musicians who play together in Europe. They are capable, mature players and their ease together and deep skills are evident in the comfort of the interaction. I've noticed the best players are something like transparent as the music speaks through them. This was like that: easy and evident. The final work was a somewhat odd: a string quartet extrapolated to a sextet, with paired violins, violas and cellos. It changes the standard form of first and second violin by expanding this relationship to the lower instruments. It's quite a fascination to hear two cellos talking different lines, sounding moderately different. Otherwise, a busy and intense work presented by the Orava (String) Quartet with friends. Someone commented that it couldn't have been played by women as it carried evident testosterone. Not sure of that one, but it was busy and energetic and approached with rabid glee. Either way, a fascinating and different take on the classics theme. 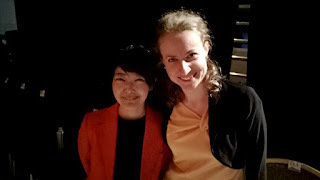 Keiko Shichijo (fortepiano) played Schubert solo then Beethoven with Cecilia Bernardini (violin). 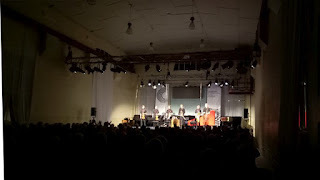 The Orava Quartet with friends played Tchaikovsky. 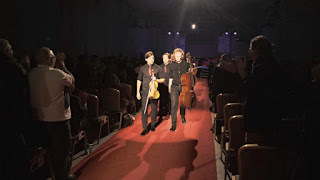 The Orava quartet are Daniel Kowalik and David Dalseno (violins), Thomas Chawner (viola) and Karol Kowalik (cello) and their friends were James Wannan (viola) and Miles Mullin-Chivers (cello).